December always brings a bounty of gifts and this season is no different. This week, the Technique Junkie Newsletter designers and writers have come together to give you a bounty of eye candy celebrating the December 2009 Technique Junkie Newsletter issue! If you started here, you may want to stop reading this post for a minute or two, and go to the Technique Junkie Blog, where the festivities start. As you follow along the path of the Treasure Hunt, you will collect clues...which will eventually take you back here. When you have finished all the clues, simply leave a comment with the word "key" you have discovered -- and you will be entered for this month's hunt. Hey, I bet you want to know what the treasure is this month! Now simply leave a comment by Friday, December 4th at 9am EST. Make sure to leave the "key" to the hunt with your comment -- the letter clues you collected along the way. The winner will be selected on Friday morning. Make sure that you leave enough information so that I can contact you to let you know you won. Note that I have comment moderation on -- so you will not see your comment appear, either. Just a reminder that Blogger does NOT leave me your email address. A great way to do this is to leave your email address in a spelled-out way, such as "p huntoon at optonline dot net." I will use my handy random number generator to pick the winning entry. You do NOT need to be a TJ subscriber to win. Good Luck! Congratulations to Deb Langdon, the winner of this Treasure Hunt! I love Christmas! 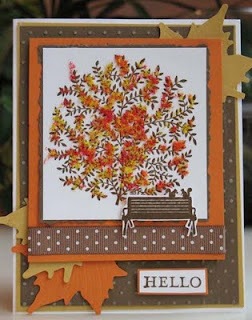 This week we are celebrating it early with our giveaway from our friends at Two Nancy's Art Stamps. The giveaway this week is a jammed-packed sheet of Christmas sayings that you will love! The card I made to celebrate the season today uses the "Ho! Ho! Ho!" saying from the set, along with the Santa from THIS SHEET. 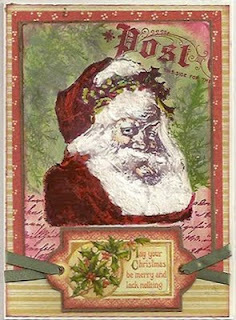 I thought that the Santa had a rather retro feel to him, so I used bright colors on my Embossed Crayon Resist background (10-09 issue of the Technique Junkie Newsletter). And I couldn't help myself -- I HAD to use liquid applique on his hat, beard and cuffs! The sheet that Two Nancy's has supplied for us is below. These sayings pair perfectly with the sheet above, or with this sheet, too. And all of these stamps are sold individually, too! Honestly, when I was making my card, I had a VERY hard time deciding which of these luscious images I wanted to use...And don't forget that YOU GET 20% OFF any of the Christmas Stamps using the code twonancys1030. That is a good deal! Okay, time for the giveaway! To enter this giveaway, simply leave a comment by Sunday, November 29th at 9am EST. If you are so inclined, tell me which of the Two Nancy's Christmas Images is your favorite! The winner will be selected on Monday morning (11-30). Make sure that you leave enough information so that I can contact you to let you know you won. Just a reminder that Blogger does NOT leave me your email address. A great way to do this is to leave your email address in a spelled-out way, such as "p huntoon at optonline dot net." I will use my handy random number generator to pick the winning entry. You do NOT need to be a TJ subscriber to win. Good Luck! The winner of this giveaway is Patricia Schwartz! Since I scrapbook as often as I can on Fridays, I am starting a new feature here: Scrappin' Saturdays. I hope to display a new scrapbook page each Saturday from the previous week (or at least, something new to you!). I hope you enjoy this new feature! This week's layout (you may have to click on it to make it larger and to get more detail) was of Zoo pictures from Cape May this summer. The giraffe is stamped (a close-up is on the right) using Close To My Heart Stamps. I did use the torn frame technique (December 2008 Technique Junkie Newsletter) on one of the mats, too. 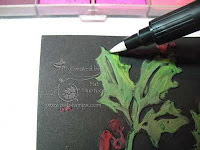 In addition, the title uses crackle paint from Tim Holtz -- I love this stuff. I especially like that I used my woefully neglected fibers to spruce up the title along the edge of the Z and the two O's! Here is a close-up of that: If you are so inclined, leave a comment and let me know whether you like this new feature! Well, that's it for today -- thanks for sharing in my scrapbook adventures! Blogger's Challenge -- Happy Fall! Today's Blogger's Challenge was the theme "Happy Fall, Y'all". Not too much of a stretch for me -- It's my favorite time of year! Living in the Northeast, the fall is always a feast for the eyes. Brilliant colors adorn the trees and then there is something we like to call "sweater weather." There is nothing like bright sunshine on a fall day, is there? My card is layered on a Cuttlebug Highlight background from the October 2008 Technique Junkie Newsletter (OF COURSE there is a technique. How could there NOT be?). Remember that I have a limited time sale on right now -- $19.95 for 7 issues (December 2009 to December 2010) OR one year renewals for $16.50. Details of each offer are on my sidebar. Just thought you might want to know! Well being. Ahhhh. I don't know about you, but one of the ways I find well-being is from fondling great paper (really, I do!). That is why this giveaway is so special! They are just extraordinary! One of the things I love about CS is the amount of detail that goes into every item they produce. Such high quality! Did you know that YOU will also receive 25% off select unmounted stamps on the Club Scrap site by using the code TJstamp at checkout? 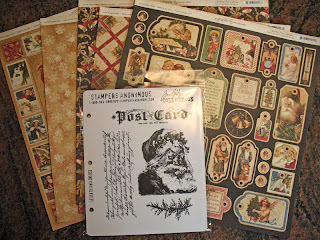 I was browsing around today and have my shopping bag full of gorgeous stamps and paper. So many beautiful things! Okay, time for the giveaway! To enter this giveaway, simply leave a comment by Monday, November 16th at 9am EST. If you are so inclined, tell me whether you think I am a bit nutty for fondling my paper! The winner will be selected on Monday morning. Make sure that you leave enough information so that I can contact you to let you know you won. Just a reminder that Blogger does NOT leave me your email address. A great way to do this is to leave your email address in a spelled-out way, such as "p huntoon at optonline dot net." I will use my handy random number generator to pick the winning entry. You do NOT need to be a TJ subscriber to win. Good Luck! 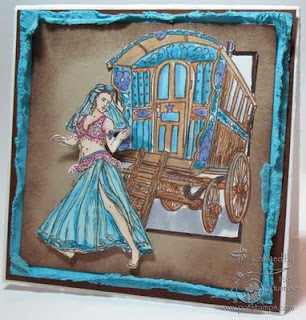 I was just playing around with these cool gypsy images from Alluring Impressions and thought I would share this creation. I used the Out of the Box Technique (October 2004 issue of the TJ Newsletter) for the wagon portion, and the Torn Frames Technique (October 2008 issue) for to highlight my creation with turquoise. Everything was colored with Copic Markers. Hope you are having a creative day! Today's Blogger's Challenge was to use a technique -- and give the directions for doing it. Rather than using an older technique, I decided to create my own -- and a tutorial for it follows. My technique,is called Painted Pastel Embossing, and the details are below. I used a cuttlebug folder with an Artistic Outpost saying stamp for the card above. The 5 petal punch poinsettia was made using the tutorial HERE. First, emboss dark cardstock using an embossing folder. 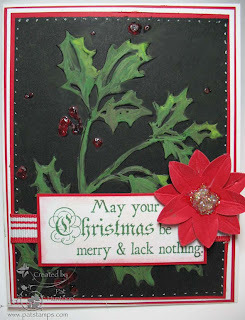 I am sure this will work with light cardstock, too, but the dark stuff will give you more drama! 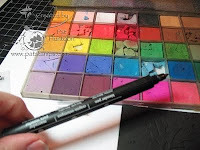 Load a wet blender pen with a hefty amount of pastel chalk. 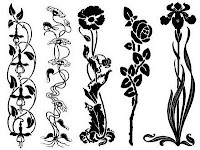 Use the blender pen to color the embossed parts of the images using colors as desired. 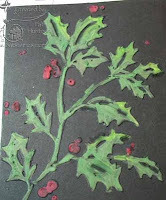 I painted my holly with a medium green, and used a lighter green to highlight the top of the leaves. 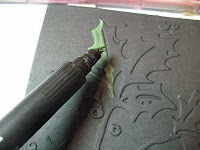 After I finished coloring, I realized that I had gone beyond the lines with my colors, so I used a clean blender pen to push the chalks off the black cardstock and back onto the embossing. It worked like an eraser! This is so easy it is sinful! 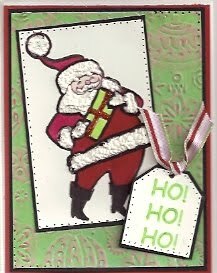 It is a great way to make your embossed cards POP. Make sure to check out the creations from the other Blogger's challenge players, too -- the is a link on my sidebar with their addresses. Today is a day to learn new techniques! 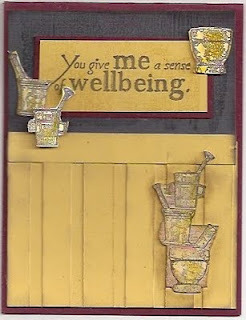 Weekly Giveaway: Tim Holtz from Croppinsville! Wow, this is some giveaway! The lucky winner of this giveaway, which is being sponsored by Croppinsville, will receive the card above, the items below, AND a $25.00 gift certificate from Croppinsville! A little about the card...I used the Tim Holtz/Stamper's Anonymous Stamps from Croppinsville to create a Collage card (TJ Newsletter June 2006 issue). I layered the collage over some of the gorgeous double-sided papers from the giveaway, and topped it off with one of the tags from the tag sheet. I colored St. Nick with Copic Markers and added dimension to the tag with Crystal Effects on the holly. You may have to click on the image to see the details! In addition to all of this, if you add THIS ITEM to your cart, you will receive free canvas flowers -- with the directions on how to use them. 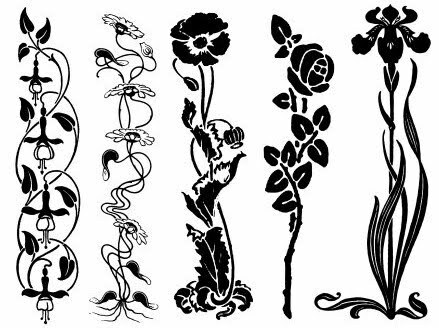 Croppinsville is a TJ vendor -- and everything is 25% off! Check out the website today! To enter this giveaway, simply leave a comment by Monday, November 9th at 9am EST. The winner will be selected on Monday morning. Make sure that you leave enough information so that I can contact you to let you know you won. Just a reminder that Blogger does NOT leave me your email address. A great way to do this is to leave your email address in a spelled-out way, such as "p huntoon at optonline dot net." I will use my handy random number generator to pick the winning entry. You do NOT need to be a TJ subscriber to win. Good Luck! Congratulations to Lou Fay, the lucky winner of this giveaway!